North Battleford, Saskatchewan to Whiteshell Provincial Park, Manitoba. After two nights at Rose and Al's place it was time to hit the road again. We had an early start and pulled out of their yard at around 7:30 am on the 18th of May. North Saskatchewan River crossing north west of Saskatoon. Before long, we passed Saskatoon, the potash capital of the world. This city also has a great university U of S, where yours truly spent some time being a so called book worm. 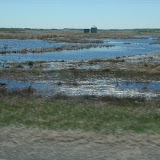 Further east we passed Little Manitou Lake at Watrous to the south (click on the map above for more details). This is a place that should not be missed, if you have not had the chance to visit it before. The lake is so salty that you float like a cork on the water. The village also has a great spa to pamper you, if you don't feel like jumping into the lake. I have visited this special place several times, truly amazing. We just passed through Saskatoon, heading east. Just got to love the open space. Further east we pass the town of Wynyard, the chicken capital of the world (just thought you wanted to know that). At the end of the the day we set up camp in the City Campground in the town of Yorkton, SK. We stopped at the City Campground in Yorkton, Sk. Nice little campground with Electric and water services. A common sani dump is available. Yorkton is a quaint and comfortable little town with lots of new developments. We went to the local museum in Yorkton. We got a friendly wake up call at 5:30 am on the 19th of May by a cute little woodpecker (Liz did not think that I appreciated it, apparently I was growling in bed calling it everything else but cute....) drumming away on a garbage can. See our movie below. Riding Mountain National Park, straight south of Dauphin Manitoba, a high plateau. We arrived in the park coming in from the North from the city of Dauphin. Riding Mountain is a really high plateau in the middle of the prairie. The campground we were hoping for was not open yet, so we just stopped for a while, had lunch, walked around for a bit, and continued our journey. The drive through parts of Saskatchewan and Manitoba showed us how the areas are still suffering from high water levels and flooding. it is very sad to see. We really feel for these people. 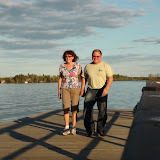 We decided to set our sights on Whiteshell Provincial Park and the Falcon Lake Campground. We took the big bypass to the south of Winnipeg and headed straight east on Trans Canada Hwy #1. Heading East on the Trans Canada Hwy. We arrived at the Falcon Lake Campground in Whiteshell Provincial park on the Manitoba border early evening. This campground with full hookups offers a lot of activities for everybody. On the beach at Falcon Lake Campground in Whiteshell Provincial Park, Manitoba. Bird lovers paradise in the bird sanctuary next to the campground. Wonderful beach for swimming, boat launching, and a birdwatcher's paradise. We went for a great hike along the lake and took in all the sights. I too am so sad for all those having to deal with rising water, unknown future and losing crops and homes. The familiar of the area near Saskatoon was good to see. All that flat land and big sky is fun to experience. Potash and chickens are good cash crops! !Looks like the weather has been good so far. Loved the rat, tat, tat of the woodpecker. Great wake up call! Also loved the Canada Goose being where he belongs and not pooping on the golf course. I'm lovin" it more every part!